A bit of a wobbly start but a trip that ran smoothly thereafter! An aid/ volunteer run to Calais which was to originally involve 6 DRS members for 4 days had to be cut down to 3 volunteers for 3 days following the near terminal problems with our van , nicknamed the “Beast”. The trip went ahead thanks to the generous loan of the Leicester group’s van (thanks Sophie). After a frantic late night FB session rearranging the journey, Fridy saw Rachel, Brian and Bob at the warehouse ready to go. Hafiz turned up to do an amazing job of packing a quart into a pint pot as we unloaded the big DRS van and crammed it all into the smaller Leicester van. Thanks to all the groups, mentioned in an earlier post, who contributed donations for the run. 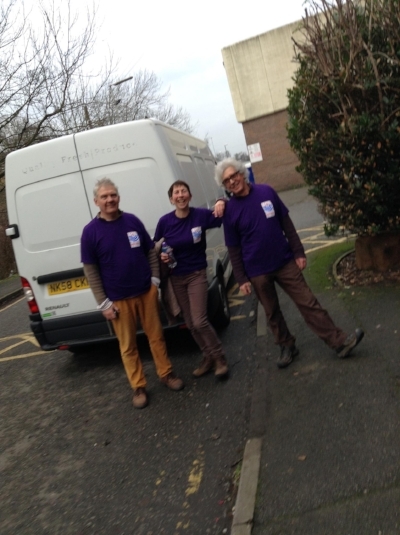 Saturday morning saw the three at L’Auberge Des Migrants warehouse, together with a impressively large group from CAMCRAG, ready to volunteer. Rachel quickly disappeared into the Refugee Community Kitchen where she worked hard helping cook the 2,500 per day meals which the Kitchen produces for migrants in Calais and the surrounding area. Anyone who has been before will be suitably impressed by the transformation of the kitchen facilities. Last Spring volunteers laboured in poor conditions under a make shift tent within the warehouse. Now the kitchen is an all stainless steel , hygienic, dedicated walled room- a real credit to the workers and donors who have brought the kitchen up to the latest health and safety standards. At least it was warm in there. Brian opted for the freezing cold job of chopping up wood which was to be distributed to the migrants on the streets and waste lands of Northern France who were enduring an unusually cold, wet and miserable winter. Bob spend some time working in the sorting area of the warehouse, always worthwhile as it gives us a real sense of what is currently in demand and some tips on how to improve our own warehouse operation. He spent most time unloading and reloading for other groups and making sure the aid we brought over got to the right people. All came together to meet up with the extremely impressive Kelvin and Heather from Paris Ground Support who were there to get their van mended and pick up the hundreds of blankets and tents we had brought to take to the 1,500 migrants living in atrocious conditions in the centre of Paris, the so-called “City of Love”. They gave us a real insight into their nightly work on the streets. Sunday saw Brian chopping wood, Bob sorting clothes and then making up food packs. Rachel was back in the kitchen until she went with RCK volunteers to give food to the hungry migrants. She was lucky to have a trouble free distribution, the night before had seen the police using teargas to break up a disturbance at a food queue. Bob arranged for the van to be packed with clothing which was unsuitable or unusable in Calais for bringing back to DRS. L’Auberge has nowhere in France to dispose of these materials. Steve has now taken those bags to weigh-in , raising some £400. So, don’t forget, when you go to Calais ‘Never come nor go empty handed’.